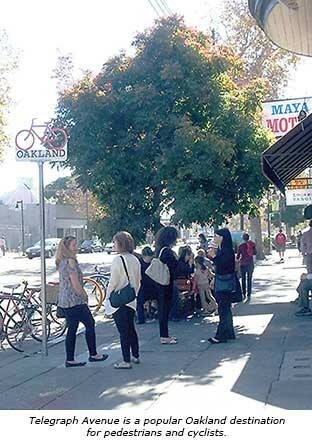 Of the 1,100 respondents — most of who were area residents and business owners — 92 percent said that Telegraph Avenue’s existing configuration doesn’t balance everyone’s needs. A majority of the respondents called for improving conditions for bicycles (protected lanes and green paint for safety visibility) and for pedestrians (lighting, safety, and wider sidewalks). Respondents also want more reliable bus service and amenities (more stops, better lighting, and real-time arrival information). The survey found that area residents want to improve conditions for bicyclists and pedestrians on Telegraph Avenue. Aside from the online survey, interviews were conducted with neighborhood associations, advocacy groups, and transit agencies, who voiced concerns over conflicts between modes of transportation, requesting improved bicyclist and pedestrian safety and more reliable public transit. Another stakeholder concern was designing the corridor to balance traffic congestion in some parts and vehicles going too fast in others. But this is a lower priority, as “respondents overwhelming[ly] support motorist facilities having the lowest priority in any future improvements,” according to the survey. Other, non-travel related concerns revealed in the survey were: increased variety and density of businesses, more trees/landscaping/greenery, improved safety/less illicit activity and crime, better cleaning/maintenance of sidewalks and roadway (less litter/graffiti), among others. The survey’s findings will contribute to drawings and design concepts, which will be presented at three separate open houses on: April 24, 6pm-8pm at Beebe Memorial Cathedral (3900 Telegraph Avenue), April 26,10am-12pm at Faith Presbyterian Church (430 49th Street), and May 1, 6pm-8pm at Humanist Hall (390 27th Street). Community feedback will help the city select a preferred design concept, and the “Final Design Concept” will be presented at a series of meetings in summer of 2014.